Graduate school can be an exciting, challenging time for students, but it can be scary and intimidating at the same time. Navigating Graduate School and Beyond: A Career Guide for Graduate Students and a Must Read for Every Advisor outlines the steps and skills necessary to succeed in graduate school and in your career. "Insider tips" help students better understand their advisors, leading to more productive advisor/student relationships. The importance of sowing well now with good habits and management techniques in order to reap big later is the central focus of the volume. 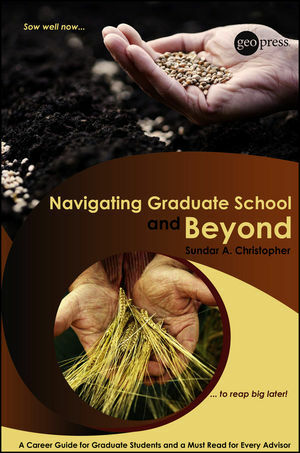 Sundar A. Christopher is the author of Navigating Graduate School and Beyond: A Career Guide for Graduate Students and a Must Read for Every Advisor, published by Wiley.